You know that staying connected with your customers is crucial to growing your small business. You’re likely already investing valuable time and resources into marketing your business, and may be unsure about the results you are seeing. When you consider the high costs and uncertainty associated with traditional advertising methods and some of the recent changes on sites like Facebook, making it difficult to reach your audience, you may be wondering how to make the most of your marketing efforts and see a real return on the money you invest. Email also fits in perfectly with your other marketing channels — especially social media. According to a 2014 Constant Contact survey, small businesses that use multiple methods and channels in conjunction with email reported 73 percent more customer engagement, 57 percent more new customers, 54 percent more website traffic, 40 percent more revenue, and 39 percent more referrals. 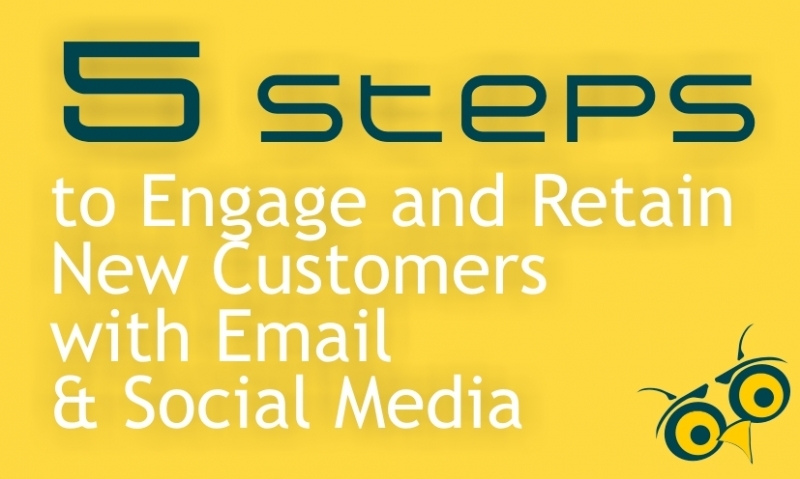 So how do you use email and social media to engage and retain new customers? While it may seem like a lot to take on, you’re probably already doing a lot of the work you need to build long-lasting customer relationships without even knowing it. This easy five-step process contains everything you need to be successful. Before you add a name to your contact list, ask the customer for permission. When you ask permission, you’re able to build a list of people who are interested in your business and are excited to hear from you. They’re more likely to open your email, less likely to mark it as spam, and will stay with you longer than contacts that are added without consent. Just make sure people know what they are signing up for when they join your list! 2. Be where your customers are. You can’t be everywhere — and that’s okay. 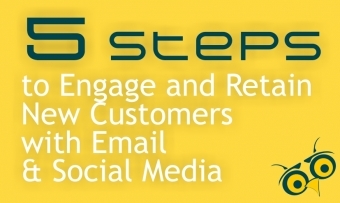 Identify the two social media channels where your customers are most active. By understanding what’s important to them, you can tailor your marketing efforts to reflect those specific interests. If you’re not sure which networks your audience is using — ask. You can ask offline, when interacting with customers face-to-face, or reach out to customers with an online survey and ask for their input. Once people join your email list or connect with you on social media, it’s your responsibility to make sure you’re providing something of value. The most effective content ideas will come directly from your audience. What are they interested in? What questions are they asking? What type of content is getting them to open, click, comment, or share? When you start with your audience in mind, you’ll not only have more people paying attention to your business, but you’ll also be able to deepen customer relationships and build the trust and loyalty you need to grow your business. Remember that retaining customers and keeping your audience engaged isn’t just about pushing out your content and promoting your products and services. You also need to take the time to engage with your fans and pay attention to what they have to say. When someone posts a comment, don’t just respond — take note of the questions that you’re hearing. You can use these insights to inform your content decisions, and also use customer feedback to improve your products and the experience that you offer. Remember that on sites like Facebook, fans can also check-in and post a review on your page. Monitor these activities and keep track of the people who are showing up and engaging with your business — these will be some of your best customers and you can learn a lot from them. Use the marketing metrics you have available: comments, likes, shares, reach, and impressions on social media, and opens, clicks, forwards, bounces, and unsubscribes in your email reports. These metrics will tell you how your content is performing and help you make smarter marketing decisions. And remember — the more you understand about your audience and your progress, the stronger your marketing results will be. But also set up systems to track the business metrics that go beyond your marketing channels. Are you seeing an increase in traffic to your website or store? Are you attracting and retaining new customers? While it will take some time — if you’ve put the right plan in place — you should see these metrics trend in the right direction. In today’s competitive marketing landscape, no tool will offer a better return for your small business than email marketing. It shouldn’t come as a surprise that 66 percent of consumers have made a purchase as a result of an email marketing message, or that businesses that use email marketing see four times the return on investment than those that use direct mail (Direct Marketing Association, 2013). Once you have your email marketing strategy in place, you can expand your reach by building a presence on social media. You can use these sites to connect with your current customers, or reach new audiences through the power of social word-of-mouth. Constant Contact has the tools you need to put your online marketing strategy into action. Be A Marketer - All you need is Constant Contact. OR Text Debi1 to 76000 to get started today!